Perched on a hilltop in a small village in eastern Europe, a young girl by the name of Julia waits while her grandma milks the cows. Warm milk is then poured over a bowl of breakfast oats which her grandma would then sweeten with leftover strudel mix. Little did her grandma know that a loving addition of strudel mix to a bowl of breakfast oats would create in Julia an appreciation for delicious breakfast oats. Years later, Julia moved to Australia where she now produces breakfast muesli with oats sourced locally. Apple Pie: Grandma’s recipe of rolled oats, apples, almonds and cinnamon. Bircher: A bircher style selection of fruits and rolled oats. Cranberry Basket: A mouthful of plump cranberries, rolled oats and coconut. 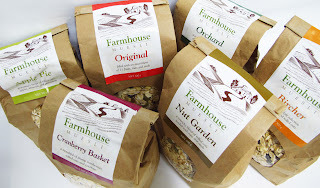 Orchard: A variety of rolled oats, nuts and ripened orchard fruits. Original: Filled with an assortment of 11 fruits, nuts and seeds. Nut Garden: A crunchy blend of rolled oats loaded with nuts and seeds.